Cookies made from cake mix take only minutes to prepare. These easy to make cookies should be called Dump Cookies, as you dump all the ingredients into one bowl to mix. A soft moist cookie, toffee-centered chocolate covered candy bar pieces give these cookies a yummy flavor. Although the recipe calls for a yellow cake mix, any flavor can be used. These easy cookies are especially good when made with a rich chocolate cake mix. A favorite recipe for years, I have to smile every time I use this typed recipe card from my Mother-in-Law. You will smile too when you taste these cookies from cake mix. 1. Preheat oven to 350 degrees F. Lightly grease cookie baking sheet. 2. Dump all ingredients into a bowl and mix well. 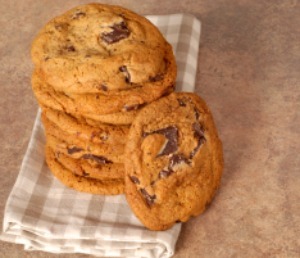 If the mixture is refrigerated for a while the cookies are better, but it is not necessary. 3. Drop by teaspoonfuls onto cookie sheet, 2 inches apart. 4. Bake for 10 to 12 minutes. Remove from oven and place cookies in a single layer on wire racks to cool.